If you’re paying attention to the world of work, the news is unavoidable. Everyone is bracing for a tech-induced transformation — and it’s already started. As a solo or small business person, technology allows you to do things that used to require scores of employees and tons of capital — and that ability will accelerate with AI. But it’s the human being at the center of it all that will ultimately determine if you succeed or fail. Is “permission marketing” still the core of what makes marketing work? The enduring power of being human and connecting with other humans. Why consistency is more powerful (and scalable) than authenticity. Why being a better marketer is more about making a conceptual shift than a tactical one. What “status roles” are and why understanding this concept is so important for understanding how humans make decisions. Why automation and AI will not create, but continue, the long-standing trend of technology replacing jobs that don’t require a human touch. Or search for “unemployable” wherever you listen to podcasts. Seth Godin: I’m Seth Godin. I teach people to see things they don’t see and to do things that they might be afraid to do. And yes, I’m unemployable. 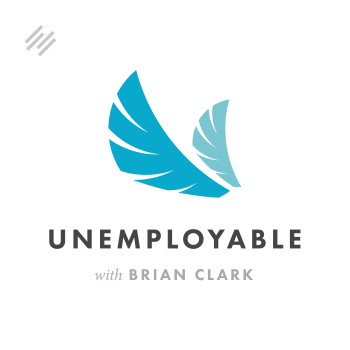 Voiceover: Welcome to Unemployable, the podcast for freelancers and entrepreneurs who value their freedom, creativity, and income way too much to ever accept a regular old job. For the full Unemployable experience, sign up for our email newsletter for tips, tools, and trends that will take your business and lifestyle to the next level. Simply head over to Unemployable.com to join us. That’s Unemployable.com. Brian Clark: If you’re paying attention to the world of work, the news is unavoidable. Everyone is bracing for a tech-induced transformation — and it’s already started. 62% of hiring managers surveyed say artificial intelligence will significantly change how we work within five years. And that’s not counting other emerging technologies, such as the Internet of things, augmented and virtual reality, plus innovations that bring sudden shifts that we’re not even thinking of yet. It’s still debatable whether these technologies will crush the job market or lead to more jobs that focus on what humans do best. But we know for sure that those who remain economically viable will fill the increased need for emotional intelligence, empathy, creativity, and abstract and critical thinking. The so-called soft skills that human beings excel at. It’s no different with marketing. Despite all the powerful tools, we now have to amplify ourselves. You can’t put automation ahead of connection or efficiency over empathy. In other words, the tools have to work for the human, not the other way around. I’m Brian Clark. This is Unemployable and it’s great to be back. It’s been quite a while since our last episode, thanks to my family trip around the world. I’ll tell you a little bit about that in an upcoming episode. But there are more important things to discuss first. And with that, let’s get rolling. Seth, it’s very good to have you with us today. Seth Godin: It’s practically a local call given your travels. Thank you for connecting. Brian Clark: Yes, I did come back to the country to talk to you specifically. Seth Godin: I appreciate it. How Much Has Marketing Changed? Brian Clark: It’s been a little bit over a year since the last time we talked. I think it was 2017 in the fall. At least every year and a half I have to touch base with you and see what you’re seeing, which is always incredibly useful given your track record. As we’ve spoken about before, your book Permission Marketing basically set me on the path 20 years ago. I really want to throw it out to you and see: is that still fundamentally the core of what makes marketing work, or are you seeing things that are changing? Seth Godin: A lot has shifted since the last time we talked, mostly about human affairs, about the way we treat each other, about dignity and respect, about spam, about fake this and fake that. I think what it’s highlighting is how deep the bifurcation goes. That there is programmatic, selfish, narcissistic, short-term marketing that still calls itself marketing that I call spam, where we’re manipulating other people so that we can win. There’s been plenty of that going on, way too much of it, and some people think that’s all there is. The alternative, what I wrote my last book about, is truly human which is what happens when we make promises and we keep them. What happens when we elevate the soft skills of showing up and seeing other people and doing what we say we’re going to do. And we’re also seeing that growing. The place it’s dying is the middle — the JCPenneys of the world and the Searses of the world where you’re selling average stuff to average people for an average price. I am firmly putting my cards on the second group of the human thing at the human scale. That’s what I’m spending almost all my time and effort on. Brian Clark: Right. It’s amazing, the thing you started with there. Back before I started Copyblogger, between 2001 and 2005, it seemed the Internet marketing shtick was going strong. And then Copyblogger was aimed (with a little bit of a mentorship from you, I dare say) to put a stake through the heart of that. Sure, we’re talking about copywriting and direct response and all this kind of stuff. But, as a human being, and I guess what you’re saying now is, “Yes, but more so.” Because the “I am” crowd is roaring back. It amazes me with all these, “You don’t need a website, you just need to spam people with this page and this and that,” People still buy into that stuff. Seth Godin: Yeah. I mean, there was a full page article in the Times last week about the industry of people who are persuading lower middle income folks. That there’s a clause, a loophole in the Constitution that involves a corporation having bought the United States, and that you could get money back from the government by saying certain magic words and stuff as long as you pay them 10 or $20,000 for some coaching. The thing that’s astonishing about it is not that there are grifters, it’s that people tell themselves the story that they have no choice. That it’s okay to grift and to steal, because it’s your turn. And the Internet has never made that easier. What Effect Does the Current Climate Have on Marketing? Brian Clark: Do you think the current climate is contributing a little bit to the, “It’s okay to grift people?” I think you know what I’m referring to. Seth Godin: Oh, for sure. Seth Godin: But here’s what we know: we know that politics doesn’t lead the culture, we know that the culture leads politics. There have been momentary exceptions to that, but I would say, in general, what we find is that we can track gay marriage and how it spread. The last step in the process was the Supreme Court, not the first step. Brian Clark: It seems so. The use of the term social justice as a derogatory term is curious to me, and justice for all is in that Pledge of Allegiance of ours. But it also creates somewhat of a minefield, do you think, in the sense that you have to be careful that you don’t offend, even if you consider yourself one of the good guys. Now, I don’t think that’s a problem for you. I have a sense of humor that could get me in trouble easily, and I stifle myself. Seth Godin: Well, virtue signaling is a marketing element. Virtue signaling can lead to holier than thou. It can lead to claims of hypocrisy and it never ends well. What we have to do is balance between, “Do work you’re proud of and sign your name to it,” with, “Understand that you are human and so is everybody else.” You’re not allowed to do something and then end with, “I was only joking.” You should do work where you don’t have to say that. But at the same time, if we’re going to destroy anybody who crosses any line, there’s not going to be anybody left. Brian Clark: Yeah, that’s my concern. That’s a valid point. I guess that’s what I’m struggling with to a certain degree, which is, “Be human.” You were the one who said, “Authenticity is determined by the audience, not you.” It’s a tricky line to walk at times between being who you feel like you are and being who your audience perceives you to be. Seth Godin: I’m not sure it’s as tricky as we might want to let ourselves off the hook for. I’m a professional speaker and I don’t swear on stage. I know how to swear, and sometimes if I stub my toe, you could hear me swear. But I don’t swear on stage, because I’m working. And I also don’t show up in my pajamas, because I’m working. When we think about, “What does it mean to be working and what are the norms and rules associated with that?” I don’t think it’s too much to ask somebody who gets to work indoors and have free snacks to know what the rules are when you’re at work. I think there are people who would like the rules to not exist or who would like there to be no boundary, but I don’t buy that. I think that we are performing when we are engaging with others most of the time. And that performance ought to be consistent more than it should be authentic. Brian Clark: True. That’s a good point, because we all have multiple selves or personas depending on context. I guess I’m of an age, and you are as well, where professionalism meant something, yet I think we’ve both seen some very talented people break the rules and get a lot of attention. Gary Vaynerchuk, he was the first person I ever saw speak and drop f-bombs left and right and people loved it. That became his thing. But I’ve never done that. Seth Godin: Right, but he’s consistent about it. Seth Godin: I’m okay with that. Where we get into trouble is if someone says, “Here’s the code you hired me to write.” And I say, “Well, but it doesn’t work.” And they say, “Yeah, well, because I wasn’t really in a good mood when I wrote it.” That’s not consistent, because I hired you to write code that would run. What we’ve got in a world where it’s super easy to tell who’s telling us a version of the truth that’s going to work in the future, to hope to get by by bullying people or finding a better excuse doesn’t scale. It doesn’t work. What Are Your AltMBA Course and The Marketing Seminar? Brian Clark: Yeah. So, you did release another book while I was out of the country. Brian Clark: I read it. It’s good. But I get the sense, and I think we’ve talked about this before, that you feel that your courses and programs… In fact, I swear you told me one time you were going to quit writing books. Seth Godin: More than once I’ve told you that. Brian Clark: And I have more than once told you I was going to write a book, and here we are. Tell me about the work you’re doing with the altMBA and The Marketing Seminar. Seth Godin: Okay. Four years ago, I started the altMBA sort of on a bet, because I hired somebody and there was nothing for her to do, so I built this program. The challenge for myself was a typical online course has a 95% dropout rate. Typical online course has tens of thousands of people in it, and it’s cheap. How could I break as many rules as possible to build something better? The altMBA, which is focused on soft skills, has no videos of me in it. It’s all project-based. It’s three hours a day. It’s not easy. There are only 120 people in a session. It’s expensive, and 97% of the people in it finish it. Seth Godin: Which is incredible. We have 3,300 alumni now who are in 70 countries changing everything around them. Not because I taught them some magical tactic in a secret YouTube video, but because they taught themselves that they’re capable of more than they thought. I ran it once to see what would happen and now we’re on our 30th running. The reason we keep doing it is because watching people transform like that is just delicious. Then we got feedback that said, “This is great, but it’s expensive and I can’t work quite that hard.” So, that’s when I did The Marketing Seminar where I took what I knew about marketing and made it into a self-paced video course with 50 videos of me in it. And that led to the book This is Marketing. So, I did it backwards that time. The cool thing about The Marketing Seminar (because I’m in it watching and interacting, almost 9,000 people have taken it) is, again, you can see where someone gets stuck. Then they get to the next thing, they write their work, they get feedback from other people, and suddenly their work is different. So, against my better judgment, I’m now in the education business. Brian Clark: No, I think that sort of satisfaction from actually seeing what happens is, you’re right, you can’t do that with a book. I asked you about the courses, because this book to me was the first time, and I don’t mean this in a bad way, but it really was selling something else in the sense that this is to get you what you need to know. Then the next step is obviously The Marketing Seminar. I don’t think you’ve ever done that before. Basically, this is the book I give people when they ask me a marketing question and then they don’t come back and ask me another marketing question. So, it solves that purpose. Are Marketing and Communication Lifelong Pursuits? Brian Clark: Yeah, definitely. But you’re in the education business now and if we look at the accelerating nature of everything, it’s a good business to be in. Do you see marketing and communication as lifelong learning subjects like we’re going to have to do with various technologies? Or do you feel like at some point people get, “Oh, I have to be a human being and a good human being and provide value,” and then they’ve got it? Seth Godin: Well, I’ve been living on the cutting edge for 30 years. Every time I sit down at my keyboard I have to describe something I haven’t described before. And I’m not even close to running out of things. I built something this morning that’s going to come out in a few weeks. That is the biggest thing I’ve worked on in a month or two or three. So, I’m still seeing how the world works in ways that surprise me. To be in the top 5 or 10% of marketers today is mostly a conceptual shift. It is not a, “Oh, you should tweet at two o’clock on Tuesdays” sort of thing. Brian Clark: Yeah, it’s not tactical. Seth Godin: I think that’s been true for a while, but I don’t think many people get the joke yet. There are still plenty of people who need to learn that part. And then the question is: will you get better at seeing how the world actually is? I was at the supermarket this morning — four empty self-checkouts, three checkouts with people waiting in line. Why aren’t people using the self-checkout? What is the dynamic that says it’s worth waiting here for five minutes as opposed to going over there? Yet, two weeks ago I was in the supermarket, a different time of day, five people waiting in line for the self-checkout, no one in line to pay with a human. What is driving that? Why are they different? It seems like a silly question until you realize it costs my friend who owns that supermarket half a million dollars to put in those self-checkouts. Should he have spent three times as much? Should he have not bought them at all? These are decisions we make every day that are marketing decisions. And if we don’t see how the world works, we can’t make them. Brian Clark: You know who uses the self-checkout, right? Seth Godin: I have no idea. Seth Godin: Ah, you think? Brian Clark: That’s why I use them. I have no problem with dealing with the machine. That was partly a joke, but we’ve actually had that conversation before. You get two different types of responses. One person says, “I’m not here to serve myself.” They have that kind of attitude. And then you’ve got other people who are like, “I’m not here to talk to anyone.” So, it’s two ways of looking at it. Seth Godin: Here’s part of my theory. If you use the self-checkout, you might get in trouble because it might get stuck, it might scan something wrong. You might make a mistake and then that person at the other desk has to come over. So, it’s a risk. Whereas if you use the human checkout, you have completely discharged your responsibility going forward. Brian Clark: The irony is there is a person who is staffed at the self-checkout, because invariably bad things happen, something goes wrong. Seth Godin: Right, exactly. So, I use the self-checkout, because I think I can do it more efficiently than the professional checker outer. That’s why I do it. Brian Clark: That’s interesting. Okay. Seth Godin: It’s because I’m an egomaniac. How Do Status Roles Influence Marketing as a Human Endeavor? Brian Clark: We’re at an interesting time, because anything that can be automated will. Probably that will happen more and more. Brian Clark: And yet, I saw an interesting article in The New York Times, and I bet you saw this, that basically human beings are luxury items now. So, the rich people get humans and everyone else gets a screen. It used to be the — what was it? — the digital divide. The poor people were being left behind without computers. Now it’s the opposite. Poor people use computers and wealthy people don’t. Do you think that relates at all to the whole idea of marketing as a human endeavor or is that just a separate unfortunate thing? Seth Godin: Well, the juiciest section of This is Marketing is about status roles. Once I encountered status roles from Keith Johnstone’s book Impro, I knew I had to write something about it, because I can’t believe I had never noticed it before. And it drives so much of every economy. One quick aside: 7,000 years ago, the Samarians got women to wear veils. The question is: how do you start that tradition? One that I am not particularly in favor of, but how do you get all the women in the community to wear a veil? How do you do that? Well, it turns out, according to David Graber, they passed the law and the law was prostitutes are not allowed to wear veils. Brian Clark: Oh my goodness. Seth Godin: Done, right? All about status roles. Where are you in the hierarchy? Are you up? Are you down? Who’s above you? Who’s below you? Who can tell you something? Who can’t? We are in this moment where if everyone has a computer, having a computer isn’t a thing of status. But if a few people can have a private jet, that’s the thing of status even if it doesn’t get you there faster. Even if it’s costing you millions of dollars a year, you have something scarce. When I think about the idea of “You have a personal assistant instead of you using email,” it’s a way of saying to yourself and the world, “Yes, I have status.” It’s not more efficient, but it sends a signal. Signaling keeps changing in our culture. But the same way we saw how quickly the Tesla took off, how quickly the Prius took off, that it’s an elite thing for a Hollywood celebrity who can afford any car to have a Prius, because there’s a status thing associated with it. Brian Clark: Yeah, and this is the most frustrating aspect between being a marketer and entrepreneur and one would hope an intellectually honest human being. We have to not only understand, but exploit is a strong word, but the vagaries of human nature are what make money. If we were all well-adjusted, we wouldn’t have an economy. You know what I’m saying? And signaling and tribalism and all this. Seth Godin: Well, yeah, and economy (from the word I think in Greek for scarcity) is if we have enough of everything, then there’s nothing left to trade. So what we do is we invent things that are scarce. One of the things it’s easiest to invent is “You can’t be in my group.” That phrase, “You can’t be in my group” makes my group more valuable, because it’s scarce. Brian Clark: And the hardest thing for people to accept is when you try to tell them that exclusionary marketing is the way to do it. I mean, everyone’s like, “Well, I don’t want to leave anyone out. I can’t do that.” Why is that so hard for people to understand? Seth Godin: Okay. The idea of the minimum viable audience says if you pick a specific group of people and delight them (and it’s easier to delight the specifics than the generals), then they’ll tell their friends and the word will spread. The alternative is to say, “No, no, no, no, I want the masses.” And we’ve been trained by culture to want to be Mary Tyler Moore, to want to be the host of Saturday Night Live, because that’s the masses. I think we all have the impulse to go a little wide until you think it through. I’m an introvert, and maybe I’m malcontent to a certain degree, but I’m also a people pleaser. It’s hard for people pleasers to push people away. But that was the most valuable thing I learned, thankfully quite a while ago. They only have 8 million users a day. Around the world on a planet with 7 billion people, approximately one out of a thousand of them use Slack. That counts the free people. So, is that enough for you, one out of a thousand? Because that seems pretty specific to me. Brian Clark: Yeah, absolutely. That’s interesting. I mean, 8 million is a huge user base, but when you think about the population, you’re right. It’s relatively tiny. How Do Humans Fare vs. Robots and AI? Brian Clark: What’s interesting to me, going back to what we talked about, about automation and what’s happening, I want to get your take on where do marketers and communicators — how do they fare as our robot overlords take over? I can’t remember where I read this, but it was so fascinating to me. The number of employees it took to have a certain market cap for companies in the ‘60s, like AT&T, big companies, compared to the head count at Facebook or Google, it’s ridiculous. And that’s only going to continue. Now you’re in the business of education, teaching soft skills, and that’s exactly what all the prognosticators say will be the thing that keeps you viably engaged as a human being. This has been what you’ve been doing for 25 years, so I don’t think you came up with it because of the threat of AI, but it certainly seems to be well-timed and well-placed. Seth Godin: Oh, actually, this has been in my writing for 30 years, and Linchpin is about nothing but this. Instead, what we need are hospice care physicians, because hospice care physicians bring soft skills to the table. They are people who cannot be replaced by somebody who isn’t in the room being a human. Will You Be Writing More Books? Brian Clark: Yup, that’s the key. And it still remains to be seen. Every time I see someone saying, “By 2060, AI can write a book or a novel,” that starts to worry me. But that’s a while away. I think I’m okay. What about, are you done with books? I’m putting you on the spot again. Seth Godin: Nah. The last time, and I haven’t talked about this before, but for a really long time, I was busy trying to fix publishing and was happy to help my publishers think differently. What I discovered though was they didn’t want me to do that and it was making me unhappy. And so I’ve now stopped. I have a great relationship with Adrian, my publisher, and I said, “Adrian, here’s this thing. Do you want to do the work of making it into the book? Because I’m done writing it.” He was great, and Nikki, my editor, was great. And then I didn’t worry about them doing their job, and I discovered that was a better way for me to be in the world. So, yes, I’ve done my fair share of showing how publishing could be done differently, but I’ve also discovered I have other work I want to do. There could be a day (I’m not working on anything now) where I could do it again, because it was pleasant and people are glad to read in that form. I will tell you that reading the audiobook almost killed me and I actually was unable to speak for three days in a row. I couldn’t even make a sound out of my mouth, and that was really scary. Brian Clark: Wow, that is scary. Audiobooks are a growing trend right now. It was supposed to be ebooks all the time and now I think audiobooks are surpassing ebooks. You think that’s related to the growth of podcasting? Seth Godin: In my case, audiobook plus Kindle was 65% of my sales. Brian Clark: Wow. And it was just that taxing? Seth Godin: Yeah, here’s the deal. You and I could talk like this all day, but as soon as you start reading something on print, the entire musculature of your rib cage and your throat changes. In the old days, I could force my way through it and do a one-day audiobook in one day. But here I was only trying to do 20 minutes a day and that plus a virus whacked my whole throat out of line, and I needed intensive 20 hours of speech therapy before I could talk properly again when I was reading. Seth Godin: I have nothing but huge respect for people who professionally read audiobooks. It’s just a whole new skill. Brian Clark: Yeah, absolutely. That’s amazing. I’m glad you’ve recovered. You sound good. How Scripted Are Your Courses? Brian Clark: When you do your courses, are you just speaking extemporaneously? Seth Godin: We have built a really sophisticated platform that no one else is using. The courses are mostly peer to peer discussion in a private discussion board built on the Discourse open source platform. It’s not unusual to get a half a million page views in the course of 30 days just from a thousand people. Then what I do is I come here into my studio, just me and the camera, and I talk straight at the camera for seven or so minutes. I have four bullet points and a story, but I don’t have a script, and I might film it all again and again until I get it right. The coolest part is you’ll then post it and 3 or 4 or 20 people will respond to what you wrote. Because what people are figuring out is the best way to learn something is to teach it to someone else. Seth Godin: Exactly. Exactly right. Brian Clark: I guess seven minutes is easier than a 45-minute keynote. You were the one who taught me that every slide is a story. And I’m nowhere near as good as you ever, still, but I never forgot that advice. I’ve also learned to do the same speech over and over if you can. I used to always create a new presentation each time and wondered why I was always a mess. Seth Godin: If you ask Jimmy Buffett what he wants to sing next, he might not say “Margaritaville.” But if you asked the crowd why they came, that’s the answer. Brian Clark: Exactly. Okay, tell everyone where they can find out more about your education programs. Seth Godin: We gave it a name. It’s called the Akimbo Workshops and it’s at akimbo.com. We are launching two of them a week from today. One on bootstrapping (that’s a second try at that one) and a new one on freelancing. Brian Clark: Okay. I think when this airs that will be today. Seth Godin: Okay, ding, ding! Brian Clark: Go check that out, great stuff. Seth Godin: If you see a purple circle on the screen, you should click it, because you’ll save some money. Brian Clark: Excellent. Okay, nice tip. Seth, thank you so much. It’s been great to catch up. It was worth coming back to our challenged country. Seth Godin: Well, I don’t want to be compared to Paris, but I’m glad you came back and glad we had a chance to talk. Brian Clark: Yeah, definitely. And best wishes in your continued success. I don’t think I need to say that, but I always do say, and I never take for granted that you have probably been the most influential person on me, on my career, on the path that I’ve been on, and I’ve done pretty well. Seth Godin: You’ve done great. Brian Clark: So pat yourself on the back. Seth Godin: If you didn’t exist, I would have to invent you. Thank you, sir. It’s really a pleasure and a privilege. Brian Clark: Take care, Seth. Seth Godin: All right, I’ll see you, bye-bye. Voiceover: Thank you for listening to this episode of Unemployable. To get new episodes of the show as soon as they’re published, subscribe to Unemployable wherever podcasts are available. And if you enjoy the episodes and find them useful, please consider leaving us a rating and a review. And don’t forget, for the full Unemployable experience, sign up for our email newsletter for tips, tools, and trends that will take your business and lifestyle to the next level. Simply head over to Unemployable.com to join us. That’s Unemployable.com. We’ll talk to you again soon.